On January 29, 2003, I witnessed a miracle. At exactly 11:30 PM, my first child, Amanda Esther Sedaka, was born. Seventeen minutes later, my second child, Charlotte Dawn Sedaka, followed her sister into the world. Two beautiful baby girls, not even 10 pounds between them, had just gasped their first breaths. This, however, was not the miracle. The miracle was that the woman who delivered my daughters—one the spitting image of me, the other the spitting image of my wife—was, in fact, not my wife. She was what is called a gestational surrogate. In the simplest terms, she was a “womb for rent” who, nearly nine months earlier, had our then five-day-old embryos implanted inside her uterus. Now keep in mind that hiring a gestational surrogate is not a decision one comes to lightly. I didn’t just wake up one morning and say, “Hey, honey, here’s a nutty idea. How’s about we get ourselves one of those gestational surrogates to carry our kids for us?” Hell, a year before, I barely knew what either of those words meant. Like anything else, having these babies was a process. one that, in the case of my wife and me, took us from “actively trying” to get pregnant, to fertility medication, to sixteen artificial inseminations, to nine in vitro fertilizations, to finally, the mother of all cutting- edge technological advancements to date—the aforementioned gestational surrogate. In all, six years, three states, five doctors, and $250,000. Yikes! So why am I writing a book about it? (I mean, other then to scare the crap out of you?) 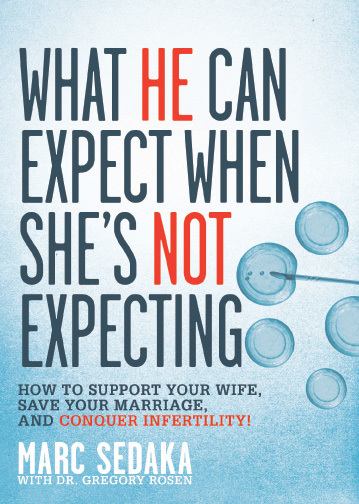 Because as a guy who’s been through the process and lived to tell about it, I know how frustrating and confusing the infertility journey can be—especially for the husband, whose role is so often ill defined and overlooked. You see, for all the support groups and self-help books and talk show segments geared toward the woman, there is very little infertility information aimed specifically toward the man. So more often than not, we poor schlubs are left to fend for ourselves—not quite sure when to chime in, when to keep quiet, when to take action, when to lay low. And rest assured, if you’re anything like I was, you’ll make the completely wrong decision every time. This book is your opportunity to learn from my mistakes. It’s written by a man, for a man, and, with that in mind, doesn’t waste your precious time with lots of technical mumbo-jumbo or disturbing diagrams of the female anatomy. (Your wife probably has you reading about 20 of those books as it is.) Instead, we’re going to stick to frank discussions, inappropriate references, and crude language whenever possible. In short, the kind of book I wish I had been forced to read when I was going through this hell—I mean, process. Now, as you’ve probably guessed, the one potential drawback to reading a book written by a layman is that he may not always have all the answers—especially when it comes to trivial little details like medical knowledge and cold, hard facts. That’s why I’ve enlisted the help of a world-renowned fertility doctor, the incredibly knowledgeable Dr. Gregory Rosen, to not only verify my information but also provide invaluable expert commentary whenever necessary. So fasten your seat belt, take a deep breath, and prepare to enter a world you never, in all your wildest dreams, imagined you’d ever be a part of. I can’t promise all the information will be pleasant (remember the quarter of a million dollars a few paragraphs back? ), but at least it will be straightforward and honest. And with any luck, you’ll come out the other side feeling that much more secure about whatever the hell it is you’re supposed to be doing now.